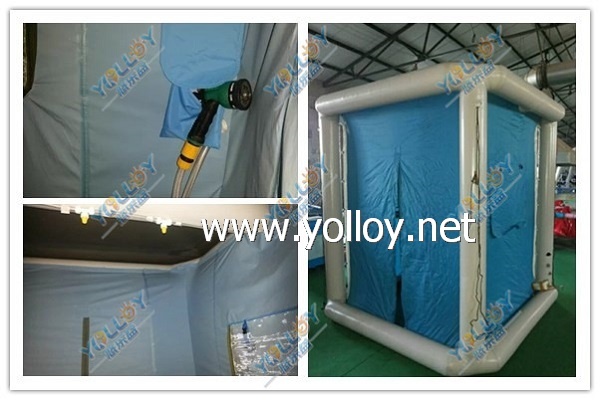 The decon shower is made with a sealed frame, at the bottom, there is an air berm which can keep the polluted water stay inside. For the entrance, there are rolled up zipper doors, this is a private protection for the ones who make decon shower inside. Except the low pressure valve, there are also relief valve and high pressure valves. So if no power, you can use compressed air tank to inflate the decontamination tent. And if over inflating, the relief valve will open itself which can protect the air frame to boom because of over inflating. This inflatable decon tent is used for 1 man decon shower. The quick set up and simple use makes it very suitable for the hospital, fire department, army and so on.